Which one of the following sentences contains an unnecessary word? In a sentence, unnecessary words provide detail but are not important to the overall meaning of the idea. For example, the following sentence contains unnecessary words: Jane’s day was kind of like a train wreck. The words “kind of” can be removed without changing the main idea of the sentence. 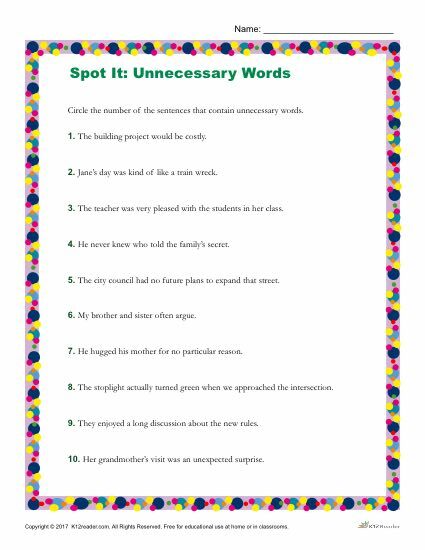 With this printable worksheet, students will practice editing and proofing while identifying words that are unnecessary. They will be asked to circle the number of each sentence that contains unnecessary words. This worksheet on editing and proofing is ideal for 5th – 10th grade students, but can be used where felt appropriate. To print and download the worksheet, click the link below.